This beefy french dip sandwich is absolutely amazing. It is one of my top favorite sandwich recipes. 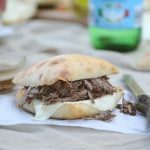 The chuck tender roast is slowly cooked in a beefy onion broth until super tender and then stuffed into a crusty ciabatta roll, that is smeared with a delicious horseradish mayonnaise. As if that wasn’t good enough…. The beefy goodness is combined with some pickled vegetables and topped with havarti cheese that is melted into creaminess. The combination results in deliciousness! This version may seem a little overwhelming with all the spices called for in the broth but it is simmered for hours, making the flavors all mellow out during the cooking process. The beef will still be full of flavor, it will just not taste as harsh as it may seem in the beginning of the cooking process. I love this sandwich so much I don’t even mind the slow cooking method. Directions how to prepare beef for French Dip Sandwich Recipe. Heat 1 tbsp of oil in a heavy cast iron pot over med-high heat. Cut beef into 2″ thick pieces and season with salt and pepper to taste. Sear meat until browned nicely. Add 1 whole onion, 6 cloves of sliced garlic, 1 tsp beef bouillon, 2 tbsp soy sauce, 2 tbsp vinegar, 1 tbsp dried oregano, 1/2 tsp salt, 1 tsp dried thyme, 1 tsp dried rosemary, 1 tsp ground black pepper, 1 bay leaf and 1/8 tsp of red pepper flakes. Pour 4 1/2 cups of water over the beef and bring to a boil. Once boiled immediately reduce temperature to low and cover with a lid. Simmer for 3-4 hours or until fork tender. When meat is fork fender, (mine took about 4 hours to simmer) remove meat pieces onto a cutting board and shred. Strain the liquid into a large bowl. Discard remnants. Place shredded meat into a medium saucepan and cover meat with 2 cups of the strained liquid. Reserve the rest for dipping or discard. Cover and keep warm until serving. How to make French Dip Sandwich. To assemble sandwiches toast the ciabatta rolls until golden. I just broiled mine in a toaster oven. Then smear the horseradish mayo onto each slice, top with cheese and toast the slices with the cheese only until cheese melts. Add some shredded beef and about a teaspoon of the pickled chopped vegetables. Dip in the beef broth or horseradish sauce and enjoy! This beefy french dip sandwich is absolutely amazing. It is one of my top favorite sandwich recipes. Heat 1 tbsp of oil in a heavy cast iron pot over med-high heat. Cut beef into 2" thick pieces and season with salt and pepper to taste. Sear meat until browned nicely. Add 1 whole onion, 6 cloves of sliced garlic, 1 tsp beef bouillon, 2 tbsp soy sauce, 2 tbsp vinegar, 1 tbsp dried oregano, 1/2 tsp salt, 1 tsp dried thyme, 1 tsp dried rosemary, 1 tsp ground black pepper, 1 bay leaf and 1/8 tsp of red pepper flakes. Pour 4 1/2 cups of water over the beef and bring to a boil. Once boiled immediately reduce temperature to low and cover with a lid. Simmer for 3-4 hours or until fork tender. When meat is fork fender, (mine took about 4 hours to simmer) remove meat pieces onto a cutting board and shred. Strain the liquid into a large bowl. Discard remnants. Place shredded meat into a medium saucepan and cover meat with 2 cups of the strained liquid. Reserve the rest for dipping or discard. Cover and keep warm until serving. To assemble sandwiches toast the ciabatta rolls until golden. Then smear the horseradish mayo onto each slice, top with cheese and toast the slices with the cheese only until cheese melts. Add some shredded beef and about a teaspoon of the pickled chopped vegetables. Dip in the beef broth or horseradish sauce and enjoy!